If you are like me, you hesitate at the checkout counter whenever the cashier asks you “would you like your receipt”? If your inner accountant is alive and well, you will find yourself wanting to keep it, which means touch it. But on the other hand, if you are already aware of the information in this article, the idea of handling a bisphenol A saturated thermal printer receipt without gloves makes as much sense as handling gasoline or paint thinner without protection. And if you are really “neurotic” like me, you may find yourself thinking about the health of the cashier, who undoubtedly has been handling receipts all shift long, and will continue to be exposed — often unwittingly — to a significant dose of bisphenol A throughout the course of their employment. This is why I cringe doubly when I refuse a receipt, because I realize that the cashier has no idea why I would do so, nor that they have suffered a harmful chemical exposure in the very act of offering the receipt to me. There are other important variables that play into how much of this chemical we absorb. For instance, bisphenol absorption is exponentially enhanced with the use of mass market skin care products, which are themselves mainly comprised of petrochemically-derived ingredients whose toxicities are also a major concern. For instance, back in 2014, a highly concerning study published in PLoS titled, “Holding thermal receipt paper and eating food after using hand sanitizer results in high serum bioactive and urine total levels of bisphenol A (BPA),” found that hand sanitizers, as well as other skin care products, contain mixtures of chemicals that can increase the absorption of fat-soluble compounds such as BPA by as much as 100 fold. A provocative study published in Environmental Health Perspectives titled, “Bisphenol A, Bisphenol S, and 4-Hydroxyphenyl 4-Isoprooxyphenylsulfone (BPSIP) in Urine and Blood of Cashiers“, reveals that the problem of chemical exposure through paper receipts is not simply associated with bisphenol A exposure, but with other bisphenol analogs as well. As we have seen with the recent increase in products explicitly labeled as “bisphenol A free“, the industries that have become reliant on the chemical are now substituting bisphenol S (and perhaps other bisphenols) in these products, despite the fact that it possesses similar toxicity. 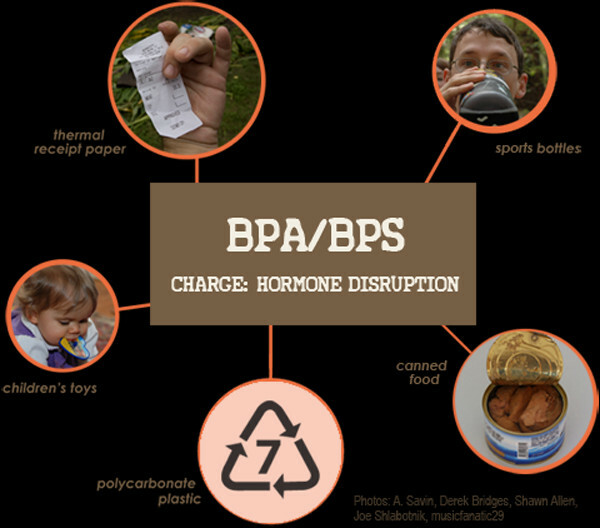 This is all the more disturbing considering recent research revealing that bisphenol S may be 100x more potent an endocrine disruptor than bisphenol A. So, what do you do if you shouldn’t touch or keep your receipts? Also, consider that there is research on natural ways to mitigate bisphenol toxicity. We have a list of over 20 natural substances, including kimchi, royal jelly, genistein and black tea, that have been shown to protect against this ubiquitous toxicant. Visit the list here.